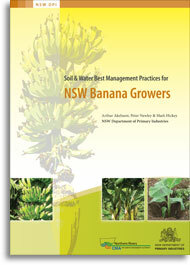 This publication focuses on banana plantations on steep lands on the NSW north coast where high seasonal rainfall is a regular event. Land managers on similar landscapes are encouraged to consider the on and off-farm effects of their management decisions. The aim of this publication is to provide practical guidelines to help growers and land managers develop whole farm practices that lead to a stable, productive and sustainable system. These practices will also have off-farm benefits to the wider community such as clean waterways and improved soil health and biodiversity. However, the general principles will apply equally to other horticultural enterprises with similar intensive systems.